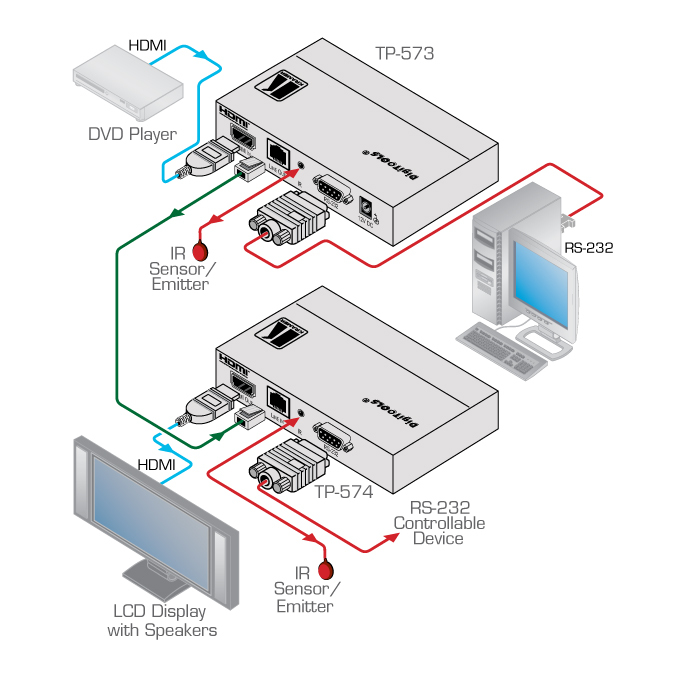 The TP-574 is a DGKat twisted pair receiver for HDMI, bidirectional RS-232 and infrared signals. The TP-573 converts the input signals to a twisted pair signal and the TP-574 converts it back to HDMI, RS-232 and infrared signals. Bidirectional RS-232 & IR Interface. - 38400 max baud rate. Power Connect System - A single connection to the transmitter powers both units. Compact DigiTOOLS� - 3 units can be rack mounted side-by-side in a 1U rack space with the optional RK-3T rack adapter. HDMI Support - x.v.Color, Lip Sync, HDMI Uncompressed Audio Channels, Dolby TrueHD, DTS-HD.